Laptops for Sale / Computer Repairs / Screen Repairs / Power Supplies / Business Orders - One stop shop for everything laptop! Rocky Mountain Laptops is your local Dell Service Center for repairs or upgrades on Dell computers and laptops. We stock a great deal of Dell Latitude parts. Call us at (720) 221-3933 to see if we have what you need in stock. If not we can order the correct part for you. We also stock a large selection of Dell laptop related products and accessories. We offer free diagnostics and can usually fix everything right here in the shop! 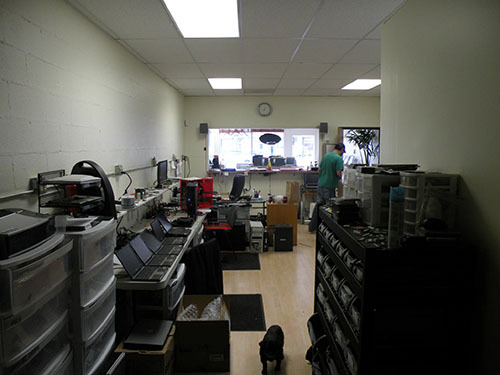 Rocky Mountain Laptops provides computer repairs, screen repairs, and high quality used laptops for sale that come with a warranty. We service the South Denver, Aurora, Littleton and Highlands Ranch areas. For repairs, we provide pickup service with a free diagnostic, and delivery service once the repair is completed. "Repairs and upgrades with Rocky Mountain Laptops have always been fast and as-quoted with great results!" "Rocky Mountain Laptops has provided several business laptops for our business. Highly recommended!" "My computer was so slow! You helped me make it faster and useable again. Thank you"
"I bought my first laptop 2 years ago and it's still running great!" "Had a laptop with a cracked screen and damage from spilled water. Rocky Mountain Laptops was able to repair the screen and computer and saved me hundreds!" "Best selection of business class laptops I have seen in Denver." "You guys have great laptops at great prices. Thank you!" "We made a business order for several new Dell laptops and printers through Rocky Mountain Laptops. Rocky Mountain Latops helped us save some money and made it easy!" Copyright © 2019 Rocky Mountain Laptops Inc. All rights reserved.